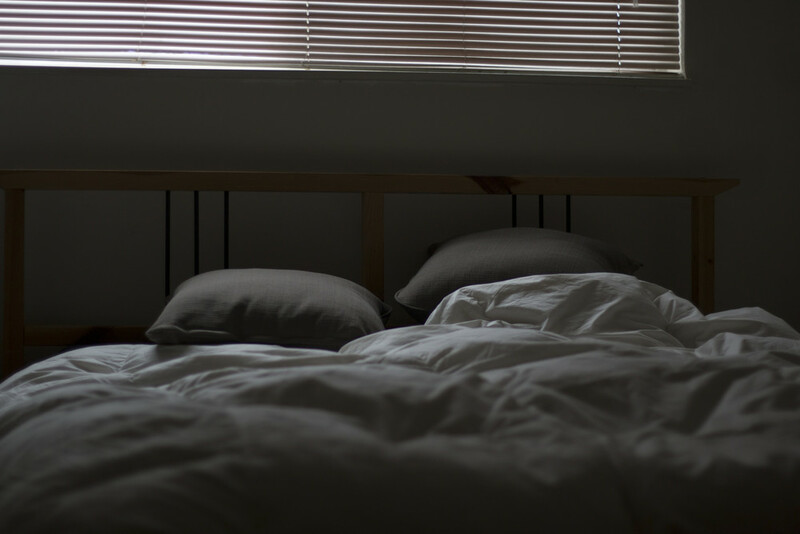 Getting a proper night's sleep can have a huge impact on your overall health. In some cultures and careers, sleep deprivation might feel like an accomplishment; you're working so hard that you don't have time for sleep! While this may have earned bragging rights in high school and college, the reality is that fatigued minds don't work nearly as well as properly rested ones. Mistakes get made and you work at a slower pace. The physical effects of sleep deprivation are also very real: sore muscles, irritability, increased risk of heart disease, impaired memory retention, increased risk of diabetes and obesity, increased risk of depression and other mental illnesses. The list goes on. Thankfully, there are many ways to increase the quality of our sleep. Firstly, though, if you suffer from sleep apnea (when breathing repeatedly stop and starts while sleeping) or insomnia, please see a doctor to get proper treatment. They will be able to help you more than I ever could. They might be able to prescribe mild sedatives to help you slumber. The bedroom is your place of solace. It should be free of distractions and external stimulation. To make sure of that, remove as many devices and technology as possible. This includes your tv, tablets, smartphones, and so on. These things both stimulate your mind and blast your eyes with bright light which tells your brain it's daytime. But it is not. It's nighttime. If there are any power strips, DVD players, or anything with a power light, don't be afraid to tape over the LED. Every photon that hits your eyelid is one photo further from sleep. I have one of those Lacie hard drives with a blue LED on it and it will illuminate my entire open one-bedroom studio. Once distraction is muted, you should also keep your bedroom at a cool temperature. Somewhere in the 60s is optimal. The body drops a few degrees while sleeping so it helps to be cool and relaxed. Nothing is worse than tossing and turning all night tangled in hot sheets. One of the most effective ways to get your body ready for sleep is a solid workout. Exercise will put your body into repair mode, which helps use those remaining bits of energy that keep you up at night. But don't get your workout in right before bed, exercising releases all sorts of chemicals like endorphins into your brain, making it hard to calm the mind. Another habit to get into is setting aside a dedicated block of time to get ready for bed. Sure, it feels good to pass out right after a marathon of Silicon Valley, but again, that's not how we're meant to function. Having a 15-30 minute wind down at night prepares your body and mind for sleep. During this time, you should turn off all electronics and go about your hygienic routine. Brush your teeth, floss, use the restroom, have a glass of water. Do all of these things at a leisurely pace. If you have a journal, write down a few things to clear your mind even further. If you absolutely must use your computer right until you go to bed for the night, install the application f.lux. This free little app (available for Mac, Windows, and Linux) will change the color temperature of your computer screen throughout the day. When the sun is high, the screen with be bright and blue-ish (like a sunlight light bulb). At night, the screen dims and warms up, mimicking the warmth of indoor lights. It's a pretty profound application that will absolutely help you ease into the night. This may seem obvious, but caffeine and nicotine should be avoided in the afternoon. Both of these are stimulants which will keep you up later and will reduce the quality of your sleep. Ideally, you wouldn't smoke at all. Conversely, alcohol should also be avoided before sleeping. Sure, it's a depressant, but that also depresses your body's ability to recover from the day. It also messes with your metabolism, disrupting REM sleep. Don't go to sleep on an empty stomach. Instead, have a small portion of a food with a low glycemic index to keep your blood sugar in check. This can help with headaches and morning fatigue. Meditation is a great way to relax the mind and body. The most effective method I have tried is all about directing and releasing energy. As I'm lying in bed, I become conscious of the weight of my body on the bed. I think focus on every section of my body and pull the energy from there to my center. As I do this, I release this energy up and out of my body. Continue doing this until you've emptied every part of every limb. Never have I been so relaxed. When all else fails, reading a fictional book will relax your mind with easy to digest stories. Non-fiction can be too intense, causing you to think too deeply about the topic and planning for your future self. Nothing is worse than waking up at 4am to a phone notification to then not fall back asleep for an hour. To remedy this, put your phone into Do Not Disturb mode when you plug your phone in to charge for the night. This will prevent those pesky alerts from alerting you. Even better, keep the phone in a different room than your bedroom. If you do find yourself lying in bed for hours, it might be time to get out of bed for a brief time to distract your brain. If you're stuck awake in bed, you'll dig yourself a hole of self-aware awakennes. Instead, get up and read a book, clean the house a little, or just mill about. Do this for a few minutes until you feel tired again. Your brain will reset a bit and crash right into that luscious pillow. The best way to easily improve your quality of sleep is to invest in the right gear. This means getting a quality mattress, pillows comforter, sheets, and pillowcases. These things really do matter. I had been using a lumpy cotton pillow my entire life until I finally got turned on to memory foam pillow. BOOM! My mind literally exploded. Seven hours in the ER later and I was back in bed on my amazing squishy pillow. I highly recommend trying this guy out (link). It will change the way you think about pillows and life itself. Nothing is worse than waking up in the morning. Unless you're a morning person, to which none of this applies. For us morning zombies, we need help. I use an alarm clock that gently fades a light up in the morning over the course of a half hour. By the time it's time to wake, your room is full with a warm glow. This alarm also has beautiful bird songs to wake you. How nice. If you're interested, here's a link. If birdsongs don't do it for you, at least pick the right song for your morning alarm. I handily wrote up an entire post on the best alarm clock songs. Some are pleasant, some are frightening. To really hack your sleep routine for the better, align your sleep and wake times with your sleep cycle. While we sleep, we go through different depths of sleep, REM being the deepest. Check out this website to figure out right when you should go to bed to time things right. I try to aim for 11:00pm - 6:30am. Keyword there is "try." The hardest part about all of this is forming the habit of good sleep. There are so many variables involved that it's tough to keep to a rigid schedule. Who knows when a work party will run until 2am. Or you discover Arrested Development for the first time in your life. Whatever the disruption, it's important to try and get right back on the train as soon as possible. One of the best ways to stick to it is by avoiding napping. Power naps might be useful sometimes, but if you get too much sleep in the afternoon, you might find yourself up much later than you should be. Now I'm off to go pass out face first on my floor.